The Falcons are off to their first 4-0 start since the 2005, and they've found a way to win in all of their games mostly thanks to the help of a smothering defense and a dominant rushing attack. Olathe South's five forced turnovers proved to be the game-changing statistic in their win Saturday. The Firebirds have finally settled on a quarterback in Kyle McFarland and that could be a scary sign for Free State's upcoming opponents. McFarland ran the zone-read option with ease on Friday, and with Shawn Knighton as the running back the Free State offensive attack is going to be tough to stop. The Hawks have now won three games in a row and they flexed their muscles in a 44-20 route of Olathe Northwest this past Friday. Olathe East is generally about as good as their rushing attack, and the three headed combo of John Kelsh, Hayden Frazier and Kendall Kelly is getting better by the week. The preseason hype has come crashing down, and the reality is that SM East has not perfomed well in either of their two biggest games against Olathe East and Olathe South. Through four weeks the Lancers have already matched their loss total from last season. The Ravens have a better team with more offensive threats this season that they've had in past years, but the entire Olathe School District is playing better football as a whole, and it doesn't look like Olathe Northwest is going to leave the district cellar anytime soon. Had the Indians not fumbled twice in the first quarter or had they been able to take advantage of SM West's array of turnovers, the Indians might be sitting at 2-2 right now. Instead, they weren't able to claim the upset and they have just one win which came against SM South. Orange Mooney & Treshawn Root, Olathe North: Since these two backs seem to feed off the success of the other the two will be grouped together as Players of the Week for this week. Mooney ran the ball 17 times for 202 yards and scored touchdowns on runs of three, 38, and 71 yards. Root added 209 yards on 11 carries, and scored one touchdown. Combined statistics: 28 carries for 411 yards and four touchdowns. 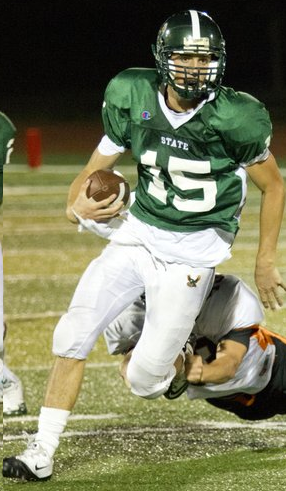 Kyle McFarland, Lawrence Free State: In leading Free State to a 42-7 victory, McFarland ran the ball 18 times for 202 yards and three touchdowns. He also completed six of 11 passes for 71 yards. Matt Elliott, Olathe South: Elliot's two touchdowns were the difference between a Falcon win or loss on Saturday. In the first quarter he took a carry 75 yards for a touchdown which tied the game at 7. Elliot then intercepted a pass and took it back 79 yards for a score with a few minutes remaining before halftime. That touchdown gave Olathe South a 20-14 halftime lead. Olathe South won 29-20. 1. Olathe North (4-0): The Eagles are 4-0 for the sixth time since 2000. On all five of their previous 4-0 starts Olathe North made it to a state championship game. 2. Olathe South (4-0): The Falcons are a scrappy bunch of players who are finding a way to win regardless of the circumstances--this is usually a good sign come playoff time. 3. Olathe East (3-1): Olathe East has developed a formidable rushing attack and the Hawks will be heavy favorites in their next four games. 4. SM East (2-2): The Lancers maintain a one-spot advantage over Lawrence for now... the winner of Friday's contest will take the pie. 5. Lawrence (2-2): The Chesty Lions were hoping they could avoid the injury bug this season, but running back Charles Jackson's leg injury could be season ending. 6. Lawrence Free State (3-1): The Firebirds quietly rank among the top four teams in the league in wins, but we'll have to see a big game victory before jumping them in the rankings. 7. SM West (2-2): The Vikings played poor overall on Friday and they were lucky to escape with a victory. The team is still on pace for the program's eighth-straight winning season, however. 8. Olathe Northwest (2-2): This is the proverbial "rubber meets the road" week in the season for the Ravens. Four of the teams remaining on their schedule include Olathe South, Free State, Lawrence and Olathe North. 9. SM Northwest (1-3): The Cougars are just not up to par with what we've seen from the program in recent years. Fortunately for the SM Northwest faithful, four of the next five games look winnable. 10. SM North (1-3): The Indians are in the same district as the aforementioned Cougars, so a poor start to the season will mean little once they hit week seven. 11. SM South (0-4): Does Ryan Lonergan collect his first career win with the Raiders in a week five game against SM Northwest? It's certainly a possibility with both teams looking close to equal on paper. 12. Leavenworth (0-4): It's that time of the season again--Leavenworth vs. Olathe North. Olathe North has won the last four meetings by a combined score of 248-13 (average score of roughly 62-3). The SME/OS game was no where near how you described it. SME outplayed OS and would have won the game had it not been for 3 interceptions, the last saved the falcons. By what SMEHarbinger wrote, that does not sound like a close game at all. A loss is hard but, is even hardern when it's self-induced. SMEHarbinger you are fighting a losing battle. Delete post. This week renews one of the great and bitter rivalries in Sunflower League football from the last decade. SMW and OE played some memorable games in the 2000s and truly got to dislike each other. It all started in the 2004 playoffs when an upstart Vikings made the playoffs for the first time since 1997. The Vikings surprised the heavily favored Hawks 21-0 in the second round ending their state championship hopes. 2005 saw a rematch again in the second round of the playoffs. O East scored first to take a 7-0 lead. West came back, marched down the field and went in for the tying touchdowd…or so it seemed. In the worst bit of officiating ever, the refs ruled the play a fumble after the Viking back had clearly crossed the goal line. The Hawks scooped it up and with everyone thinking the play was over, ran it all the way back for a 14-0 lead. A later phantom pass interference call with no West defender within 15 yards of the receiver led to a Hawk field goal and the officials had given East a 24-7 halftime lead in a game that should have been 14-14. East went on to win 37-7. In 2006 the two teams were placed in the same district (giving lie to the post here a while back that districts are determined geographically from north to south…there is no way you could have what was then the monster district of SMNW, SMW, OE and BVNW without skipping geographically over SMS and BVN!) and showdowns loomed. 2006 was a magic year for the Vikes as they got revenge and thrashed the Hawks 35-6 in district play on their way to the state title game and a heartbreaking 21-14 loss to Hutch. In 2007, the Vikes started 5-0 but an almost surreal string of devastating injuries left West to basically start over with a new team by game 6 where they were thrashed by Free State. They started to get it back together though and by the time they face the high flying Hawks made a good game of it. The Vikes were tackled on the 1 yard line just short of what would have been the tying touchdown on the last play of the game and suffered a 21-14 loss to the Hawks. In 2008, both teams went 9-0 in the regular season and the seeding came down to a coin toss. OE won and got the #1 see, while West got the seemingly easy first round match up with BVNW. The Vikings, with their leading rusher suspended for the game struggled mightily through the first half but led 14-10 at the break. Then Coach C seemed to panic and went to a 5 wide spread offense they hadn't run once all year (and which the Huskies saw a lot of in the EKL). The result, 2 INTs and a first round loss to the Huskies and the much anticipated 1 vs. 2 matchup never happened that year. The Hawks also lost in the first round that year. 2009 saw a regular season meeting between the two teams in game 2. The Hawks grabbed a 14-0 lead and the always obnoxious Hawk fans teased the stunned Vike faithful with chants of 'We can't hear you'. It was great fun to see them sit on THEIR hands as the Vikings completed a comeback and the game slipped away from the Hawks 17-14. Both teams again lost in the first round of the playoffs so the much anticipated rematch never happened. Of course the two teams did not play in 2010 with the Vikings again losing in the first round and missing a chance to play the Hawks who made it to the semis before falling to O North. I was at that game, It's funny how one person can view the same game through different perspective. You can also say South left a lot of points of the board, and East was lucky it was as close as it was. Their (South's) kicker missed a FG and an EP (There's 4 point), Their main receiver dropped a sure fire TD pass (7 points), there was a really close call that denied OS a TD on the hair line of the end zone before the end of the Half, I believe it could have been called either way (7 points), and the QB had a 60 (or so) yard TD on a boot called back on a Block in the back that occurred literally 40 yards behind the runner (7 points). So if you want to play the 'what if' game, you could say OS should have won (25+21) 54-21. I agree, SME needs to come to the realization that they are underachievers. Their best days were the days before the season started. They sure have disappeared from the board. OS looks good, ON will have their hands full when that match up occurs. They are underachievers in their inability to beat someone ranked higher than them. Saying SME is 4th in the league is being very generous considering they are 2-2 along with 2 otherteams. Looking at records alone, they should be tied for 5th. If by east you mean OLATHE east you would be right they are the only team to beat ON in the regular season, SME needs to beat ON before I respect them at all. Agree, ON OS match up will be a good one. No one even mentions SME on the board any more, other than to say they are middle of the pack underachievers. Thought this may be the year they stepped up with the big boys, guess I was wrong, one player (Eliot) doesn't make a team.